7.20am – Emergency call received, where the keys had been lost for the drugs room in a rest home and staff needed to gain access to the room quickly. I managed to get there within 15 minutes where I picked the lock with my handy electronic pick gun gaining access to the room, then proceeded to make keys. Staff were very pleased to get the patients medications out! I was pleased to have enough time to then get to my next job. 8.30am – First booked job of the day in West Harbour, replacing a worn out grip set lock with a new modern one, making sure the lock is working correctly once fitted. The aluminium side garage door was not latching correctly either. After assessing the door it seems to have dropped slightly requiring some adjustments to get it working again. 10.45am – Second booked job in New Lynn at a panel beaters where a replacement ignition and door lock need to recoded to suit the sample key. 12.00pm – Third booked job in Henderson, a ranch slider door has become very difficult to use and is not locking at all. I’ve checked the door and found the rollers need to be replaced they have either worn away or broken completely causing the door to drop and slide along the track, which causes the lock and strike to misalign. So I get to work carefully removing the door taking out the broken rollers and installing the new ones. I get the door back in place, make adjustments to the door and realign the lock and strike so that it can lock again. Customer is very happy, “door is sliding with a finger touch, like a new one”. 1.30pm – Back to shop to stock up van and have a quick bite to eat, while I’m there a distressed lady comes into the shop she’s locked her keys in the car with her daughter in there. Luckily she’s parked in the shopping centre our shop is located in. I quickly grab my car opening kit and walk over I get to work on opening the door thankfully get it open fairly quickly. Daughter & mum are very happy. 2.30pm – Fourth booked job in Ranui, I need to make keys for the ranch slider, main & side garage doors and install a deadlock on the front door. 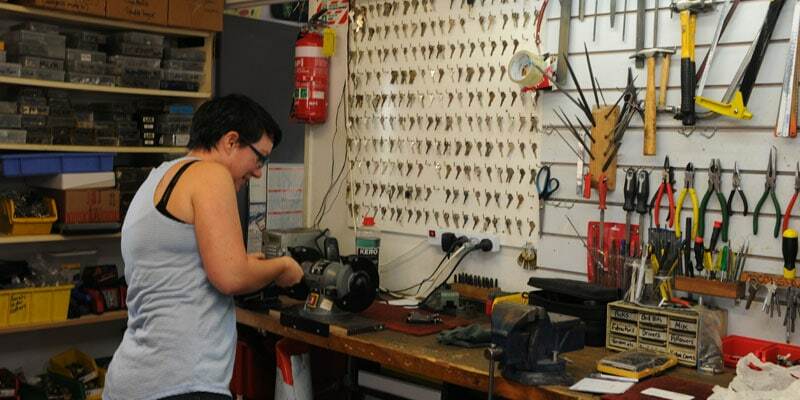 4.00pm – Fifth booked job in Waimauku, installing a new aluminium lever lock set on a consultation room. The existing lock is old and faulty, no longer available, replaced it with a modern equivalent. Great result in the end. 6.15pm – End of the day, time for home. 7.45pm – Emergency call in Massey client stuck inside lift, overide key not working. Got to the site and luckily found that the key wasn’t being used correctly, showed worried staff how to use properly. Very happy to get client out of the lift and now know how the lift lock works. Back home again.